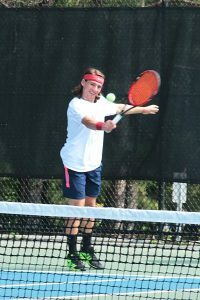 A 3-1 victory over LaGrange on Tuesday propelled the Dunwoody Wildcats into the Class 5A boys’ state tennis playoffs Final Four against the winner of Starr’s Mill and Cambridge. It will be the first Final Four appearance since the 2006 season when a 3-0 win over LaGrange put the Wildcats into the Class AAA state finals where they lost to Westminster. Freshman Cole Brainard cruised to a 6-0, 6-0 victory at No. 1 singles over LaGrange’s Blake Kendall as the Wildcats took a 1-0 lead early in the match. Brainard is now 12-3 on the season. The No. 2 doubles duo of freshman Cade Lautenbacher and sophomore Adam Drucker improved to 9-1 on the year by knocking off LaGrange’s Jackson Kueizl and Gavin Battle 6-2, 6-2 to give the Wildcats a big 2-0 advantage with the No. 3 singles match starting. Senior Brandon Gita got off to a slow start falling behind 1-2 in the opening set of his match against Pierce Skinner. He rallied to take a 6-4 win in the opening set and closed out the match with a 6-2 victory for the two-set sweep to clinch the Wildcats first Final Four appearance in 10 years. Gita is now 12-5 on the season. LaGrange did pick up a win at No. 1 doubles with Jas Sinsh and Connor Mahan winning in straight sets over JT Melton and Daniel Bynum. The Chamblee Lady Bulldogs moved into the Elite 8 of the Class 4A girls’ state tennis playoffs via a 3-2 road win over West Laurens on Tuesday night. Chamblee (15-2) will make just its third appearance in the Elite 8 in the program’s history, but the second time in the past three seasons as they go on the road to face Woodward Academy on Friday (April 29) at 12:30 pm. Sophomore Olena Bulikha improved to 15-0 on the season and 32-0 in her career by cruising to a 6-0, 6-0 win at No. 1 singles for the Lady Bulldogs. Freshman Grace Pietkiewicz won 6-1, 6-4 at No. 2 singles to improve to 11-2 on the season while junior Leeza Ershtein pushed her record to 12-2 on the season with a 6-4, 6-2 win at No. 3 singles. Senior Hannah Rosen and freshman Madeline Meer fell to 6-6 on the season in a tough 4-6, 6-7 (6-10) loss at No. 1 doubles. Kendalle Smith and Emilya Ershtein had their No. 2 doubles mark fall to 5-3 on the year with a 3-6, 2-6 loss.